We’re talking about Russia today—but first, your hosts talk about a webcomic from The Oatmeal about the Backfire Effect, a psychological phenomenon that tracks the ways in which our brains respond to ideas that challenge our most fundamental ideological suppositions. Studies conducted at the University of Southern California suggest that, when we are faced with such ideas and challenges, our amygdalae fire up and put us in a state of fight or flight—such a phenomenon presents obvious, real ... See More world problems. Your hosts use this discussion as a segue into a discussion about memetic theory and the emotional and psychological state of the social media landscape. In the second half of the episode, Ryan and Andrew talk about a tumblr memo that catalogued the expulsion of numerous Russian bot infiltrators on their platform. Ryan points out some of the patterns in the Russian bot names and, in doing so, shows how said pattern functions as a mean to spread discord within the American political factions. This serves as a springboard into a larger discussion about how the Kremlin attempts to foster a sense of doubt towards democratic institutions and why the Kremlin wants to support nationalists and take down globalists. 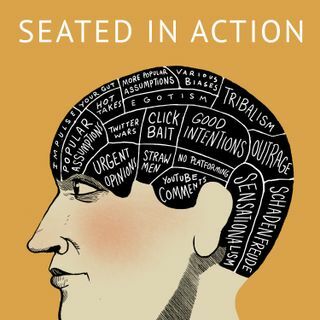 You can reach out to Seated in Action by email us at seatedinaction@gmail.com Be sure to subscribe to our podcast, check out our website at www.seatedinaction.com, stayed tune for our next episode, and leave us a (preferably favorable!) review on your podcast app of choice.